The trio of 48m loa craft is assisting waste management company Cory Environmental to obviate more than 25,000 lorry movements on London’s congested road network. Three further ash barges have been brought into service on the River Thames by waste management company and lighterage operator Cory Environmental, writes David Tinsley. The craft are of the same design as two barges which joined the fleet in 2015. The new Ashwin, Ashley and Ashton have been assigned to the task of shipping 200,000tonnes per annum of incinerator ash from Cory’s waste facility at Belvedere to the Ballast Phoenix plant downriver at Tilbury Dock, for processing into construction aggregate. By using the Thames tideway to transfer the bottom ash, transported in sealed containers, Cory estimates that it will obviate more than 25,000 lorry movements on London’s congested road network. Cory’s general manager Neil Caborn says: “Compared to the existing fleet of waste barges, these new barges have been specifically designed for our Thames operation, to carry heavier payloads of ash.” The swim-ended, flat-bottomed barges are 48m in length overall and 8m in breadth, with a loaded draught of 2.66m. Each craft’s load of 26 containers of 20ft ISO size and 25tonnes laden weight is double-stacked transversely in an open hold with high coamings. The initial two craft of the type, Ashburn and Ashcroft, were introduced last year following delivery from the McTay yard on Merseyside. Of the latest trio, Ashwin and Ashley were built at Birkenhead by Cammell Laird, while Ashton was completed at Meuse & Sambre’s Liege yard in Belgium. The source of the incinerator bottom ash, the Riverside Resource Recovery (RRR) Energy from Waste (EfW) plant in the London Borough of Bexley, uses waste which would otherwise be thrown into landfill to generate electricity. As one of the largest and most efficient plants of its kind in the UK, permitted to receive 785,000tonnes of waste each year, its R1 status means that the facility is classified as an energy recovery rather than a waste disposal operation. Cory’s tugs and lighters feed the plant with domestic and commercial waste loaded at the Smugglers Way (Wandsworth), Cringle Dock (Battersea), Walbrook Wharf (City of London) and Northumberland Wharf (Tower Hamlets) transfer stations along the upper tidal Thames serving various London boroughs. 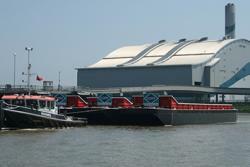 As a result of the latest investment, the company’s fleet now stands at five tugs, five ash barges and 47 waste barges.